This year the Washington State Legislature approved SB 6057. Thanks to all the hard work by all you beekeepers and supporters we are now recognized for our part in agriculture. This is theDepartment of Revenue notice; DOR_2015_honeybeekeepers. More clarification is coming after the Legislative Chair meets with the Department. Stay tuned! (1) “Agricultural product” means any product of plant cultivation or animal husbandry including, but not limited to: A product of horticulture, grain cultivation, vermiculture, viticulture, or aquaculture as defined in RCW 15.85.020; plantation Christmas trees; short-rotation hardwoods as defined in RCW 84.33.035; turf; or any animal including but not limited to an animal that is a private sector cultured aquatic product as defined in RCW15.85.020, or a bird, or insect, or the substances obtained from such an animal including honey bee products. (2)(a) “Farmer” means any person engaged in the business of growing, raising, or producing, upon the person’s own lands or upon the lands in which the person has a present right of possession, any agricultural product to be sold, and the growing, raising, or producing honey bee products for sale, or providing bee pollination services, by an eligible apiarist. (b) “Eligible apiarist” means a person who owns or keeps one or more bee colonies and who grows, raises, or produces honey bee products for sale at wholesale and is registered under RCW 15.60.021. (c) “Honey bee products” means queen honey bees, packaged honey bees, honey, pollen, bees wax, propolis, or other substances obtained from honey bees. “Honey bee products” does not include manufactured substances or articles. 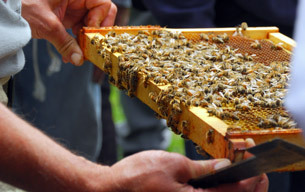 So what does this mean for beekeepers?